A petition on the government website, calling for Brexit to be cancelled has broken all records, surpassing 5 million signatures today. Margaret Georgiadou, 77, who started the petition, says that she has received death threats over the phone. Her petition has received so many signatures since Theresa May addressed the nation attacking MPs for the failure of Brexit and telling the nation she is with them that the website crashed. A petition circulated by Brexiteers calling for the UK to leave the EU with or without a deal has received 500,000 signatures. Nine in ten Brits now regard the handling of the Brexit negotiations a “national humiliation”. 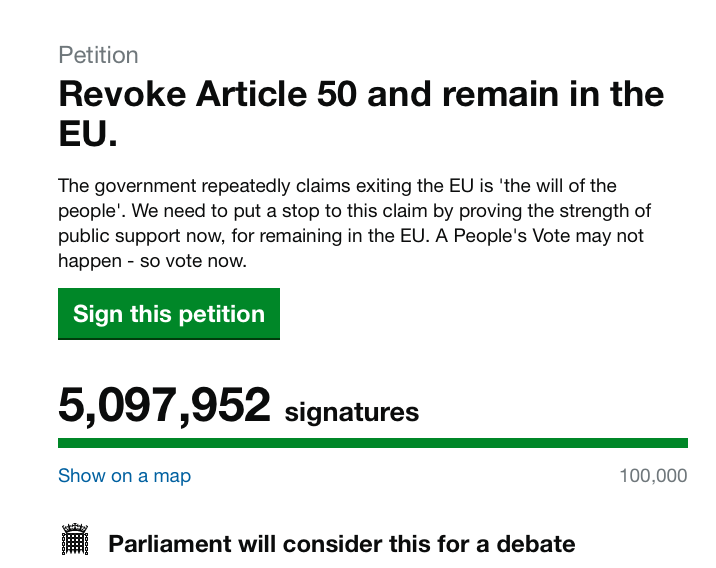 You can see the current petition is leaping up thousands at a time: https://petition.parliament.uk/petitions/241584. Brexiteers and pro-Brexit media have tried to dismiss the unprecedented epetition. Brexiteer Julia Hartley-Brewer wrongly suggested people could sign the petition more than once with the same email address for instance, as the Express claimed most signatories were outside the United Kingdom. According to the pro-Brexit paper, Brexiteer Nigel Farage wanted a public inquiry to understand why people in Russia and North Korea were signing it. But parliament’s petitions committee insisted that 96% of signatories were from the United Kingdom. The landmark was hit after hundreds of thousands of people took part in London’s People’s Vote march. Many Brits abroad also took to social media to say that they had signed the petition and were not indeed foreign bots. 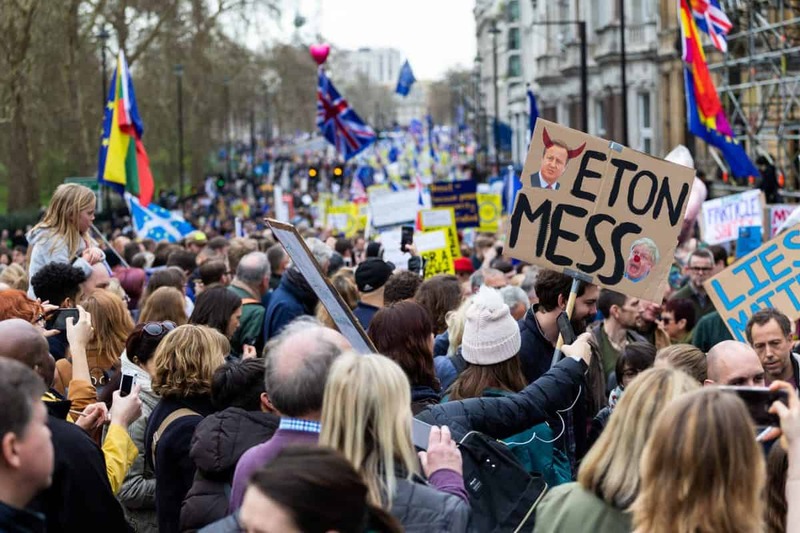 Saturday’s “Put It To The People March” saw an estimated million protestors march through the capital asking for the British public to have the final say on Brexit. It took place on what was supposed to be six days before the UK was due to leave the EU, before an extension to the departure date was given. 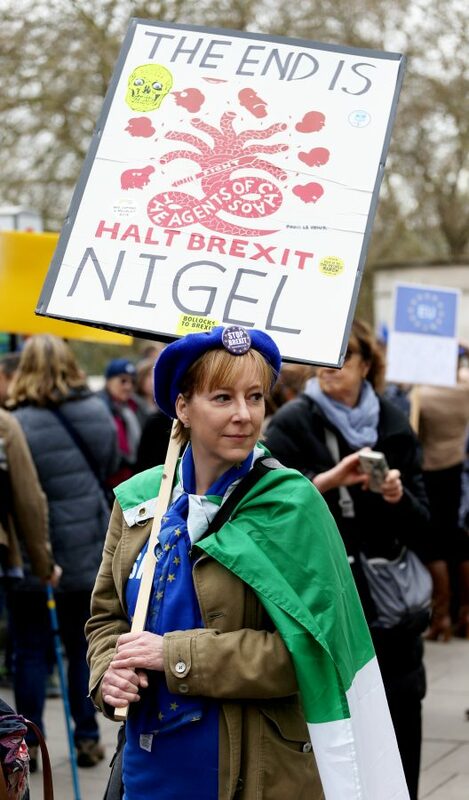 In contrast, Nigel Farage’s Brexit Betrayal March, which is making its way towards the capital from its starting point in the North East, has managed to attract just a few hundred people despite being billed to have thousands of walkers signed up.